HOLLYWOOD, FLORIDA IS A PLANNED PARADISE thanks to Joseph W. Young, Jr.
FOUNDER’S DAY, AUGUST 4TH CELEBRATES JOSEPH W. YOUNG JR.
Beginning in 1935, August 4th has been a date celebrated in Hollywood as Founder’s Day to honor the birthday of Joseph Wesley Young, Jr., founder of the city. As I have written about Founder’s Day before, this time I’ll narrow down to some of the beginnings of both Young and his city. But before that, let me also mention Young’s beloved wife Jessie Fay Cook, who was born in July, 1877 in Wisconsin. Joseph Young was probably born in Seattle, in 1882. As I discuss in my biography of Young,* there is no written document of his birth. Probably it was noted in a family Bible, but as Joseph was one of seven children, any such family document may have gone with one of his sisters. There is no state record for the simple reason that in 1882, Washington was not yet a state. The Territory of Washington was an incorporated territory of the U.S. from 1853 to November, 1889, when the State of Washington was admitted to the union. Joseph Young, Jr.’s presence first appears on an official record in the 1892 census, at age ten. Among major events in Washington Territory around the time of Young’s birth was the arrival of the Northern Pacific railroad at Puget Sound in May, 1888, linking the Seattle area to the eastern U.S. Later, as a developer, Young made certain that all his properties had easy access to good transportation. And one more event during Young’s youth in the Pacific Northwest, was the Klondike Gold Rush. In 1898 apparently Joseph Sr. and 16-year-old Jr. did give gold prospecting a try. They didn’t strike gold, and by 1900 Jr. had moved on to California. Young Comes to Florida. Moving forward now to the Florida portion of J. W. Young’s life. He first came to Florida in January, 1920, with his wife Jessie and business partner Ed Whitson. Young was following the lead of millionaire entrepreneur showman, Carl Fisher, and others who were bitten by the urge to create beautiful tropical paradises. 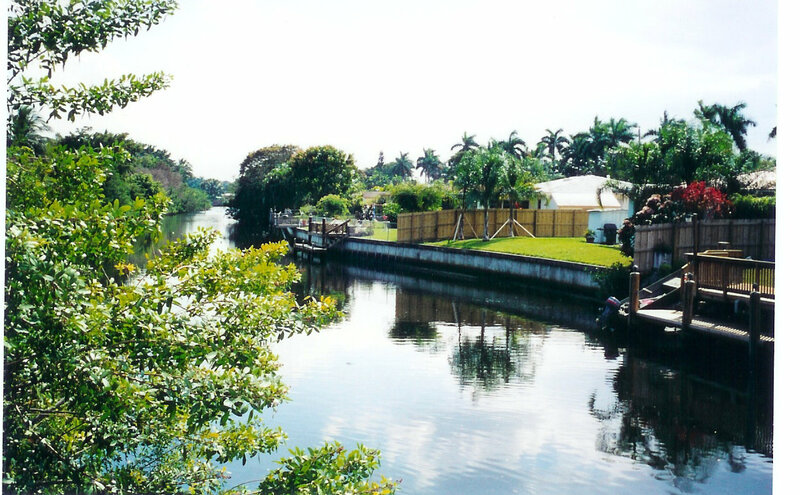 Looking around the Miami area, Young’s first step toward acquiring his dream site was to buy five commercial lots in Allapattah solely to develop then sell them, raising the cash he would use to buy his perfect site. In the summer of 1920 he returned alone and found his site, between two little farm towns in Broward County, Dania and Hallandale. 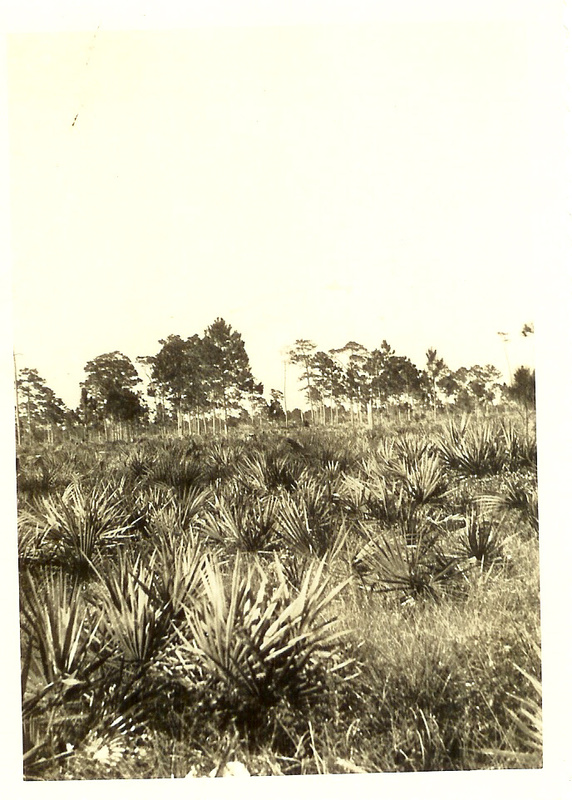 In 1920 Joseph W. Young bought a square mile of undeveloped Florida land, high, dry ground that was chiefly covered with palmetto and jack pines. Young envisions a city. Now I will try to show how visionary Young was in creating his beautiful city. After seeing the undeveloped bit of scrub land, Young hurried back to his Indianapolis office with sketches he had made for the city plan. At right is the engineer’s drawing of the beginning of Hollywood’s city plan, made from Young’s sketches, according to several who were close to Young in 1920. 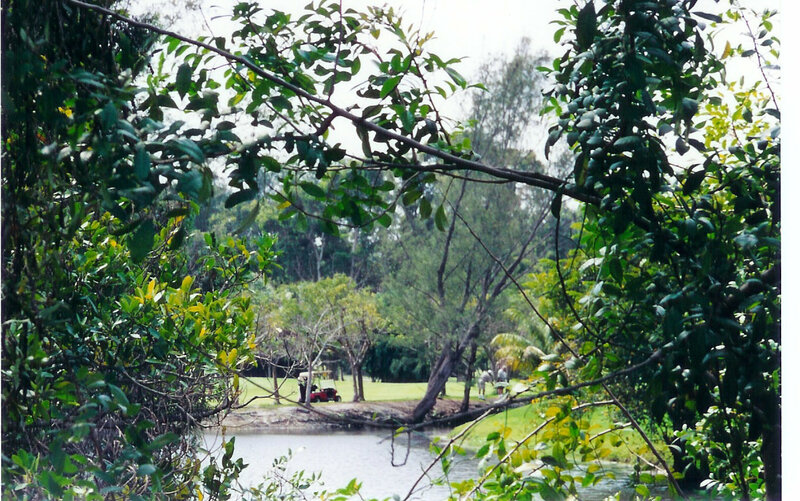 Quoting them in her book, Virginia TenEick says Young described his ideas: a wide boulevard extending from the ocean to the edge of the Everglades. Centrally located will be the business section. On each side of the [eventual] boulevard and opening into the canal [then the Inland Waterway] we will create two lakes, each with a turning basin for yachts. Material dredged from the lakes will be the fill to elevate the lowland then occupied by mangrove. We must plan large park areas and locations for schools and churches. A golf course, a large clubhouse or community building. This will be a city for everyone, from the opulent at the top of the industrial and society ladders to the most humble of working people. Young’s own background would put him in the “working people” category. He and Jessie moved every year from 1919 to 1925. This was their home in Indianapolis in 1920, a nice middle-class home for a family with three school boys. J. W. Young would soon thereafter become a millionaire. To grasp the genius of Young’s vision, go back to the 1923 plat, above. The horizontal dark line near the center represents the two north-south arteries through the property, the FEC railroad and the Dixie Highway. (U.S. 1 was not in Hollywood before 1930.) Find the golf course, the open rectangle near center right. From its bottom edge (today’s 14th Avenue) up to the top of the plat was dry ground. From today’s 14th to 11th Avenues was tidal. The rest was simply watery marsh, to the Inland Waterway, and across to the totally empty beach barrier island. Note that Young said he would “create the two lakes.” He meant just that. No lakes existed when he bought the land. Here are some photos to try to suggest the effort it took–and the vision–for Young to create his city from the property he had acquired. First, here is where Young had his surveyors begin to lay out his city. 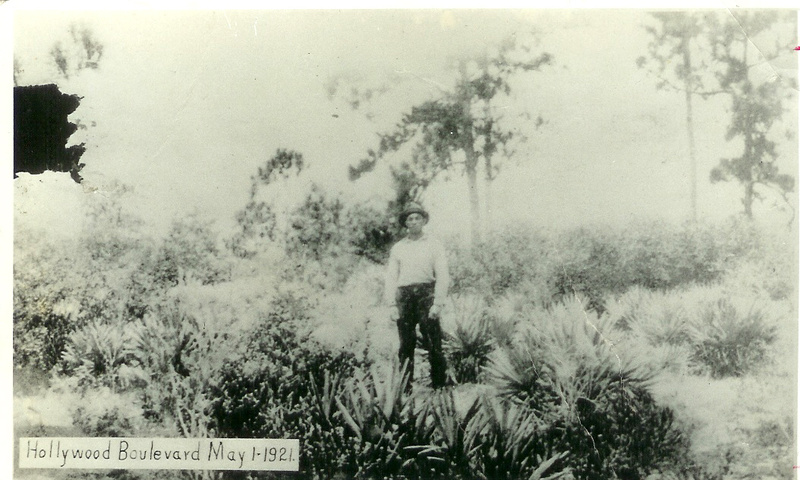 This is my father, Tony Mickelson, head of Young’s surveying party, standing in the underbrush where Young planned that his wide boulevard would cross the Dixie Highway and the FEC railroad tracks. Mickelson looks west (where the tracks are), with his back to the east. This photo, taken in May, 1921, was published in the August, 1922 Hollywood Reporter. Below is the same site just three years later, looking to the east from the railroad tracks down the Boulevard now lined with stores. At left, downtown Hollywood in 1925. My father, who knew every inch of the land in early Hollywood, described it in a later interview: The elevation of the present Federal Highway (18th Avenue) was 10 feet, he said, with a gradual eastward slope to 14th Avenue. It was tidal from there [to 11th] and the rest was pretty much under water. The survey had to be accurate to insure proper drainage. The highest point was at the railroad tracks, 12 feet above sea level. This aerial from April 1924 by Clyde Elliott shows what Young’s engineers were working with. Hollywood Boulevard begins just about center left and goes diagonally to the top. The dark horizontal line is the railroad and Dixie Highway. At upper right, the glare is from the watery East Marsh where the engineers were creating North and South Lake. The last road along the upper left is Johnson Street. 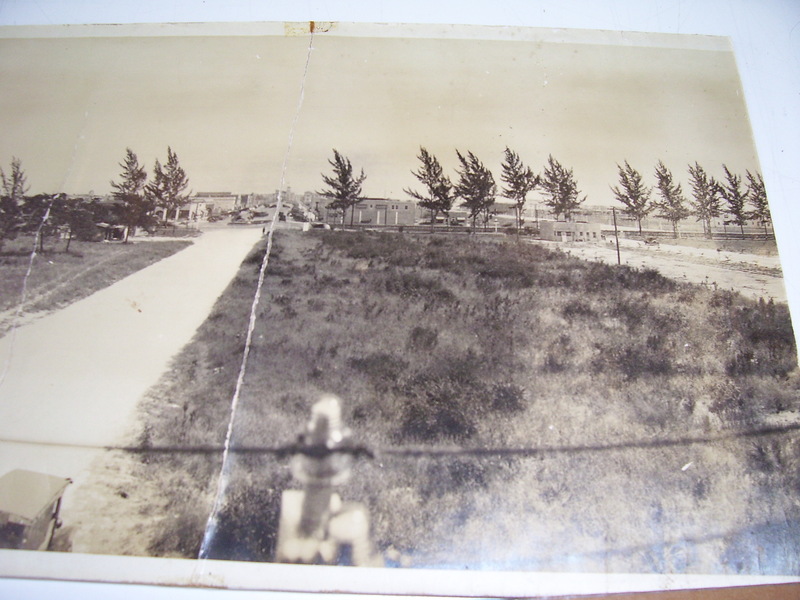 When Young bought the property, the future Johnson Street was a dirt track used by Dania farmers in their tomato fields. Young needed to create a road on this track to the canal (Inland Waterway) and cross from there to the beach island. So by digging a channel alongside the track, his men were able to float a dredge along it, digging up rock to build up the roadbed for Johnson Street. I don’t know who the man is, standing on the dredge. Here is another of Clyde Elliott’s aerial views from April, 1924. This looks east from directly over Hollywood Boulevard. Along the bottom run the Dixie Highway and FEC tracks. Circle Park (today’s Young Circle) is at the center, and the still-draining Lakes section is along the top. Harrison and Tyler Streets, nearly as wide as the Boulevard, have been rock-surfaced, as have some other streets, and buildings appear. running free over the sandspurs, also periwinkles, lantana, and other flowers that grew wild in the empty lots and sheltered little rabbits and mice, and the occasional gopher tortoise. there to the Cutoff Canal. Here is the C-10 Canal today, taken from the Johnson Street bridge crossing. Below is its source in the Orange Brook Golf Course, where a fresh-water spring rises above ground. It first created the West Marsh, and today it’s the source for the C-10 canal. More about the Little Ranches area. Riley Walter, another early pioneer who bought property in the Little Ranches, in a later interview described that part of Hollywood around 1922. He said that pineapples were grown in today’s City Hall Circle and surrounding area. Turpentine mangoes grew in the Polk-Taylor area, around 23rd Avenue. The site of the Orange Brook Golf Course was an abandoned farm, with an old barn still there in the early 1920s. And at 24th Avenue and Johnson Street, south side,there was a frame house where Young Company black laborers lived in 1922-23. Young Landscapes His City to the East. Hollywood west of the Dixie Highway was allowed to grow more or less as it pleased after some palmetto was cleared, but east of the Dixie Young had the land cleared right down to the dirt, so that he could landscape it. He hired a professional horticulturalist, Charles Olson, from Rochester, New York, to grow and design beautiful plantings. 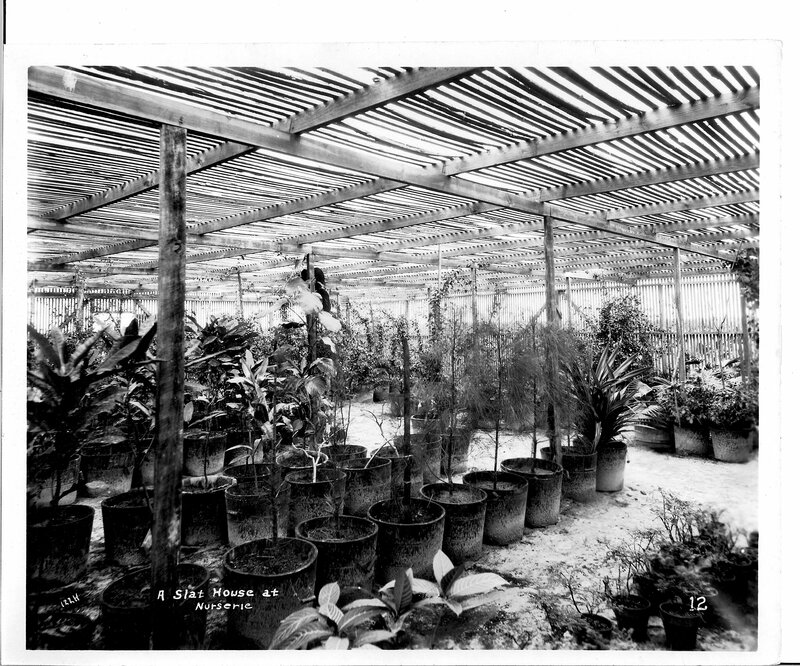 Here is the slat house, or greenhouse, where Olson planted seedlings and cuttings, of coconut and royal palms, pithecolobium and eucalyptus trees, hibiscus, pandanus, ixora, poinsettias, oleanders, bougainvillea, crotons, and numerous other plants, up to 100 varieties. Young had Olson design plantings for the Circle, Golf Course, and along the sidewalks in the Central (Parkside) and Lakes Sections. Another reason for Hollywood’s lush garden look today. More about August activities. On the beach, in the summer of 1923, Young began to extend his Broadwalk south from Johnson Street down to Washington Street. When the Broadwalk was begun, it ran north from Johnson to about today’s Sheridan Street, according to aerial views of the beach. Tent City begins. 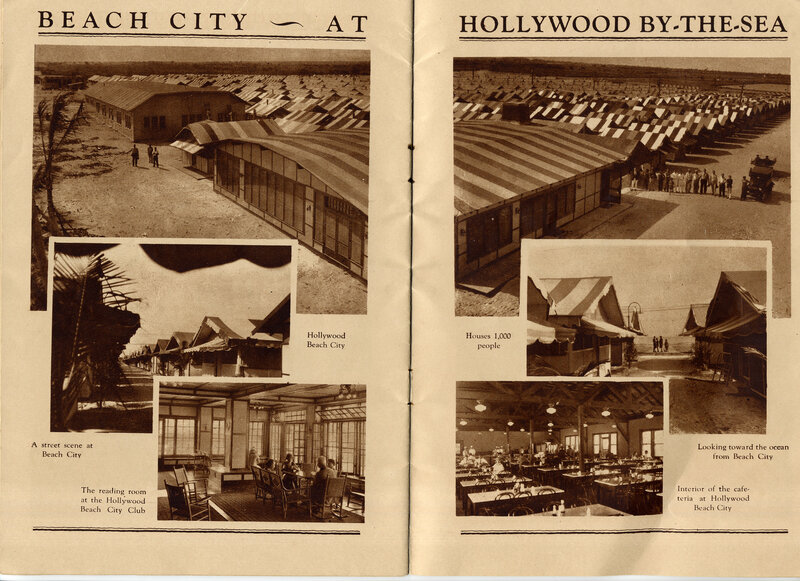 Also in August, 1923, Young began planning Tent City, or Beach City, a “resort under canvas” to accommodate the huge throngs flocking to Hollywood, who wanted to stay on the beach before the Beach Hotel was built. Young got the idea from similar tent colonies in Catalina, CA. They weren’t actually tents, but frame cabins with floors and canvas roofs, with electricity, running water, and maid service. They varied from two to four rooms, over 100 cabins by 1925. In this view, taken from the east by Bobby Yale, South Lake can be seen in the distance (center right). The entire “city” was laid out in rows like streets. As the brochure, left, indicates, visitors were provided with a cafeteria (bottom right) and a lounge and library (bottom left). Needless to say, Beach City did not survive the 1926 storm surge. On August 3, 1923, President Warren Harding died during a visit to Seattle, and Calvin Coolidge became president. 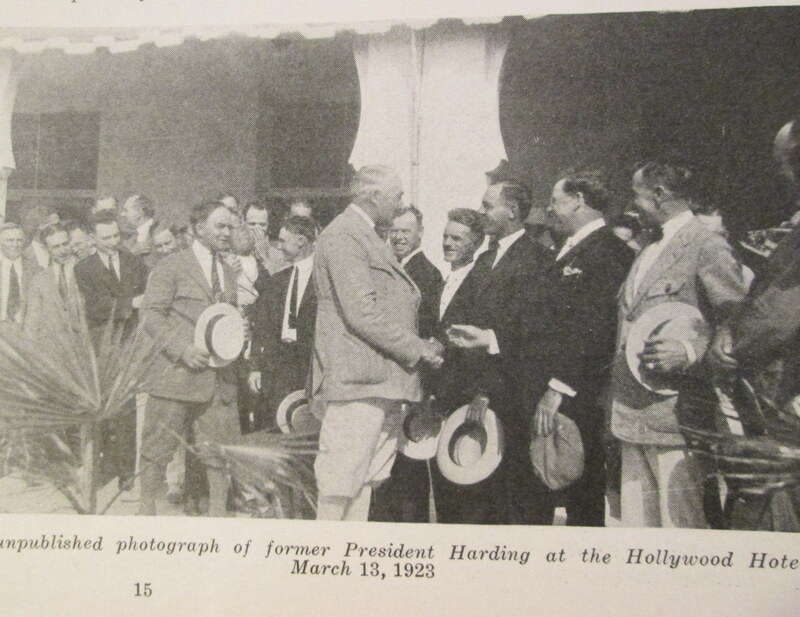 This was of special interest to Hollywood because only that previous March the president came for golf and lunch at the Hollywood/Park View Hotel, where he was apparently greeted by Young’s entire sales force. A tall man, here he is at the center of the photo. Upon his death, Young’s company changed the name of Circle Park to Harding Circle. 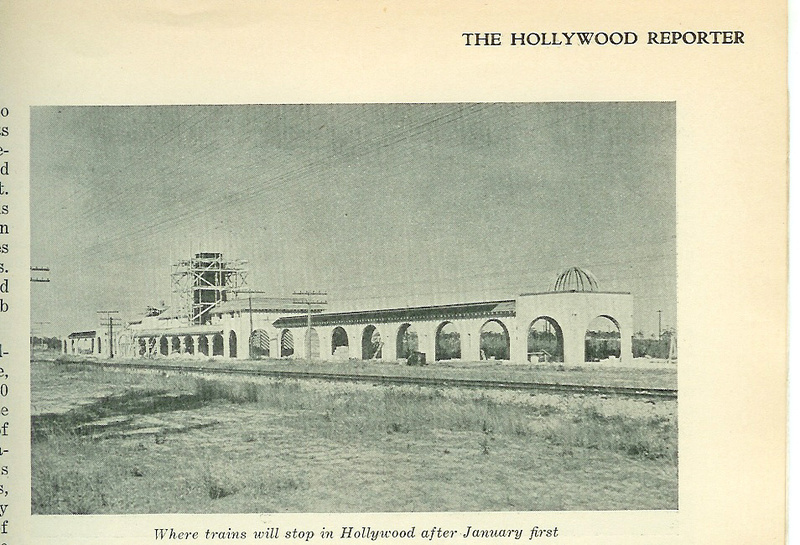 On August 20, 1924 a train on the Florida East Coast line made its first passenger stop in Hollywood, after Young had a beautiful and expansive station built to receive passengers. Once completed, this Mission Revival style building was considered the most beautiful railway station along Florida’s east coast. A Visitor Describes One of Young’s Sales Methods, Excursions. In August, 1925 a W. A. Smith of Fort Lauderdale was toured around Hollywood then wrote about it. Like many others Smith was impressed by “this mammoth development,” and the magnitude of one of Florida’s largest real estate projects. 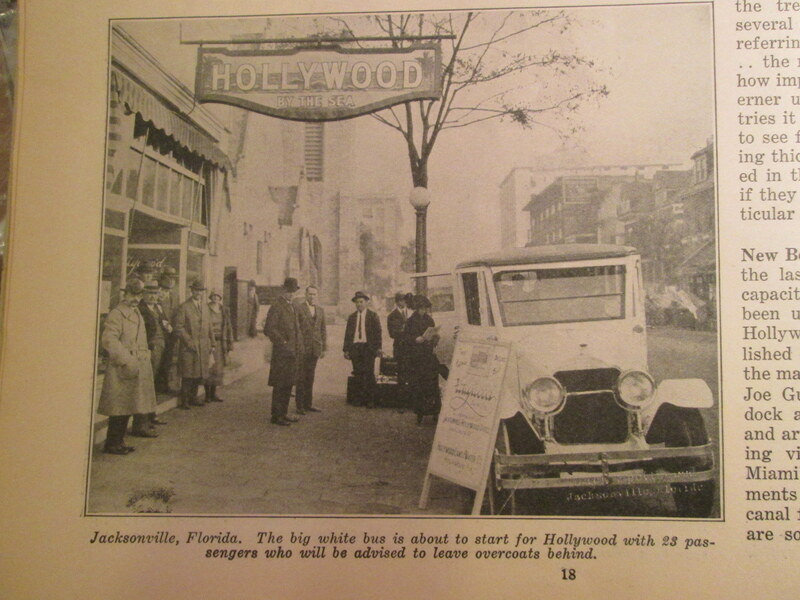 He noted that every day some 350 people were brought to Florida on Hollywood excursions, coming by boat from New York and by special trains from other sections of the country. In Hollywood, he said, they were selling not only property but Florida good will. Smith continued that once there passengers from the north were put up at the Great Southern Hotel, the Park View Hotel, and two hotels in Miami (Young couldn’t build hotels fast enough for all the visitors). Here is the Park View Hotel with several tour buses lined up in front of it. It was just a short walk across Circle Park to the Great Southern Hotel. 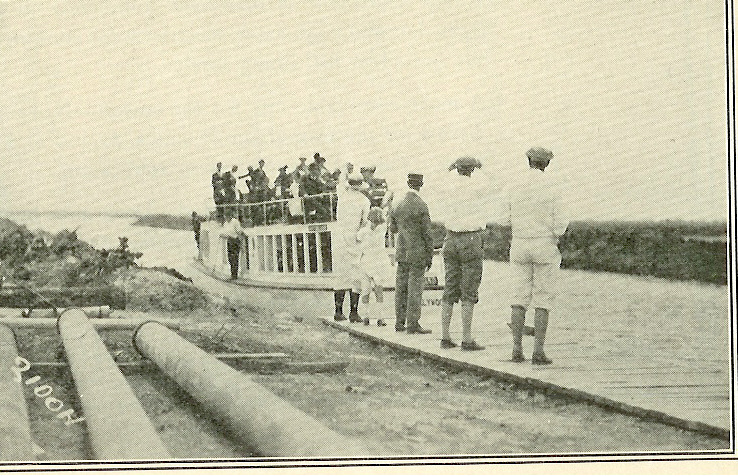 Some were brought from Miami Beach by boat up the Inland Waterway, to be met by salesmen in plus-fours. Incidentally, this is one of my favorite photos, showing well-dressed tourists arriving in what appears to be an area of near-desolation, where salesmen hope they will buy property. Of course the beach was to the left, and the growing city down the Boulevard to the left, and apparently many such visitors did make purchases. For what they might have seen would be street scenes such as this, around Monroe Street and 16th Avenue, with rows of well-designed houses on rock-covered streets with sidewalks, and little palm trees planted in the verge. Landmark Woman’s Club. Finally, one more August event, and a landmark today. In August, 1927 the Hollywood Woman’s Club opened its clubhouse, built on land donated by J. W. Young. Club President at the time of dedication was Mrs. Oliver (Mae) Behymer. Designed by architect Frederic A. Eskridge, the clubhouse is now on the National Register of Historic Places. Hollywood Is a “Paradise Planned.” My title this month comes from the grand thousand-page tome by Robert A. M. Stern, David Fishman, and Jacob Tilove, Paradise Planned. The Garden Suburb and the Modern City. To my great pleasure, Hollywood is included among beautiful cities from around the world, with a reproduction of Young’s elegant city plan, several photos, and a half-page of text. Unless otherwise identified, all images are courtesy of the Hollywood Historical Society. If you borrow these images for your own use, please credit the Hollywood Historical Society–and any other credits seen below the image. Thank you. Dear Readers, sorry that I neglected the blog this past year. I’ll try to write more in 2019. 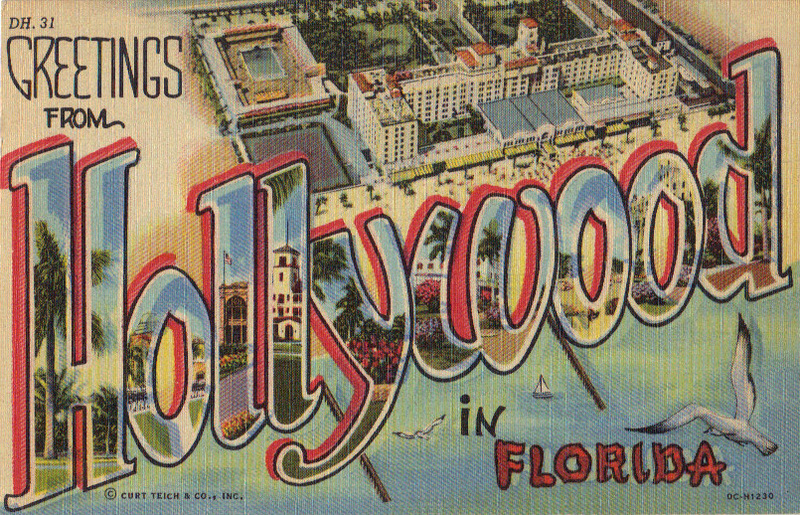 If there is a Hollywood, Florida topic you would like me to cover from the years 1920-1950, please send an email. Currently I’m researching a possible 3-person biography about 3 from Hollywood who served in World War One, an army pilot, a Navy man, and an army nurse. On February 17, 2019 I’ve been invited to take part in a big Hollywood celebration, Vintage South Florida, held on Hollywood Boulevard, Downtown. I’ll be in the Hollywood Historical Society’s Chautauqua tent, in front of Melina’s, and will give a “soapbox” talk on J. W. Young’s original–and lasting–design for his city. March 14 to 17, 2019, I’ll be taking part in SleuthFest 2019, sponsored by the Florida Chapter of Mystery Writers of America, held at the Embassy Suites by Hilton, Boca Raton, Florida. November 3, 2019 I’ll give a PowerPoint talk on “Flight in Hollywood, 1920s to 1940s: From Bi-planes to Grumman IBF Avengers.” This Hollywood Historical Society lecture will be held at the Stirling Road Branch Library, 3151 Stirling Road, Hollywood, Florida, 1 – 3 pm. Free. This post will be in support of preservation efforts regarding Hollywood’s original buildings. At present, designated historic areas are Downtown and the Lakes Section. Those are certainly deserving, but surely it’s time to recognize the original Central section as well. 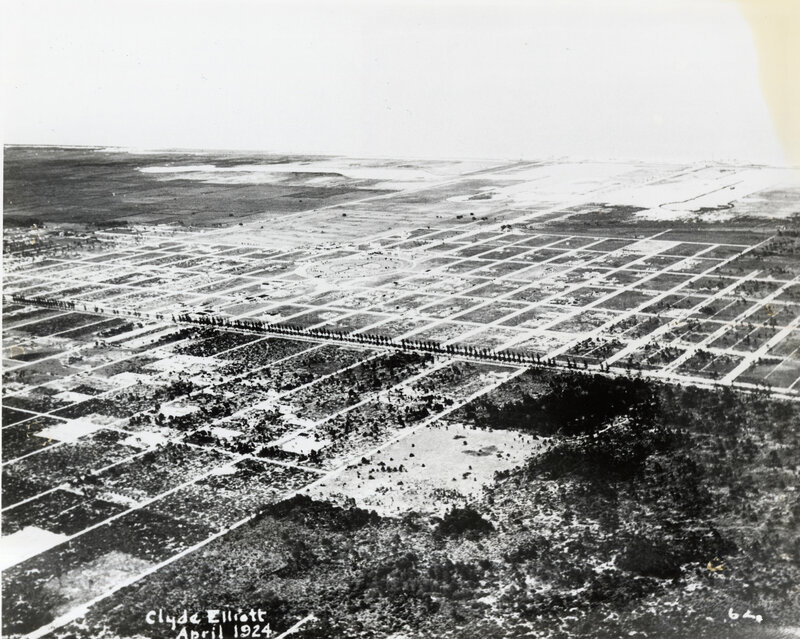 From the Boulevard, streets in the Central section radiated north to Dania, south toward Hallandale, east to about future 14th Avenue, and west to future 28th Avenue. Today Young’s Central section has become Downtown, Parkside, Royal Poinciana, and the western edge of the Lakes section. 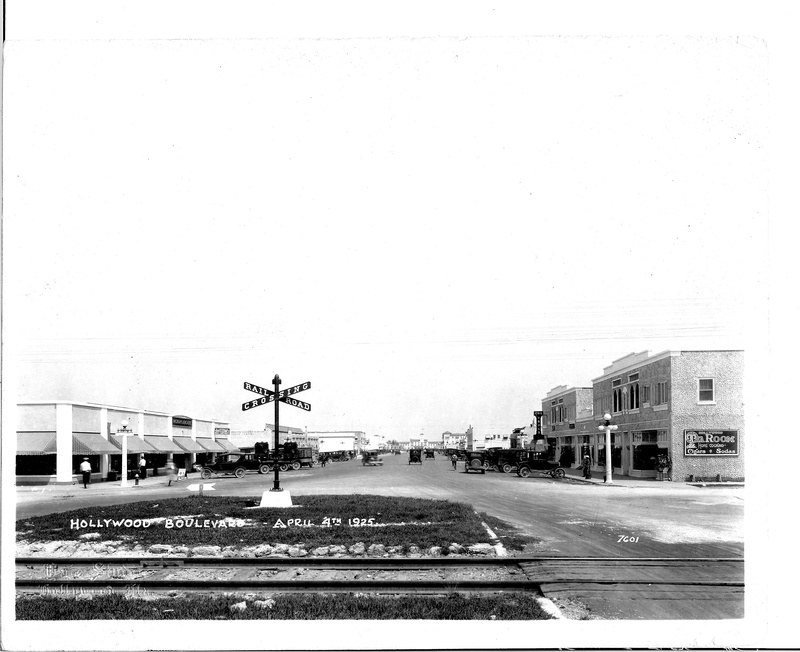 By the time Young had his city incorporated in late 1925, the Central section was filled with businesses in Downtown, and homes, apartments and small hotels chiefly in what is now Parkside, as well as Royal Poinciana. Downtown has rightly been designated “historic,” but for reasons unclear to me, Parkside, which contains Hollywood’s oldest homes, has not received that designation. I believe efforts are currently underway to correct this incomprehensible oversight. I’m not trained in historic preservation, but I am a historian and can provide data needed to support historic designations. Hollywood had a remarkable building boom between 1922, when Young’s Hollywood Land & Water Company erected the first permanent structures in his brand-new city, and 1926, the year of the devastating September hurricane. No doubt to get the ball of settlement rolling, in 1922 Young had his company, together with Indiana building contractor Harry K. Bastian, erect the first permanent homes in Hollywood, in today’s Parkside. In order to maintain a certain look for his city Young hired the architectural firm of Rubush & Hunter to design a series of suggested houses, chiefly in the California Mission Revival style to which Young was partial. Rubush & Hunter, Sample house design for Hollywood By-the-Sea. City of Hollywood Archives. These first houses were built along 19th and 20th Avenues, between Van Buren and Washington Streets. 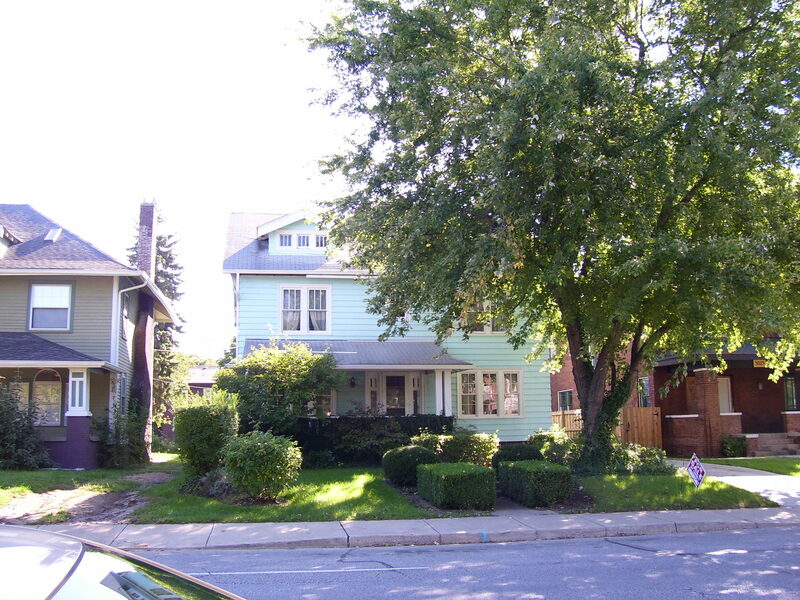 The first house to be occupied was at 1901 Madison Street, now gone, owned by Canadians Charles and Emma Roden. Also significant in this historic group of Hollywood’s first homes, dating from 1922 is the one at 1855-57 Monroe Street, below, which became the home of Virginia Elliott TenEick in 1923. She was, of course, Hollywood’s first published historian. Surely this house deserves historical landmark designation. Information about all Hollywood’s historic sites can be found in the Hollywood Historical Society’s archives. Handy sources are TenEick’s History of Hollywood, and my Guide to Historic Hollywood and the 2015 booklet The Hollywood Historical Society Historic Downtown Walking Tour. All of these are available at the Hollywood Historical Society; my Guide is also available through Barnes & Noble and Amazon. Notable among the early buildings in today’s Parkside are a sizeable group of small apartment buildings. They proliferated at that time because the hundreds of people flocking to Young’s thriving new city needed somewhere to live as they made land purchases then built homes. Remember, as late as 1922 there were only a handful of permanent buildings in Hollywood which was essentially flat, cleared ground. When my father was sent by Young to Hollywood in 1920 to start surveying the newly purchased land there was nowhere for him to live–at least in Hollywood. Mrs. Bloom’s boarding house, Dania, Florida, 1921. Collection of the Estate of Tony Mickelson. The Hollywood Land and Water Company didn’t build apartment buildings, but many others did, and today many of those that were built according to Young’s building codes between 1923 and 1927 still stand, particularly in Hollywood’s first residential areas now known as Parkside and Royal Poinciana. Recently I made a list of pre-1926 apartments in Hollywood that were designed in the California Mission, or Spanish Mission, or Spanish-Moorish style. We use those terms because that is what they were called at the time that they were built (“Mediterranean Revival” is a misnomer since there was no reference to the Mediterranean intended). Hollywood’s founder in 1920 had lived in California from 1902 to 1916 when the Mission Revival movement was at its height, and this was the architectural style that he decreed should be used in buildings in his city (also the California adobe, and the bungalow). Coronado and Castillian Apts., 1852 & 1856 Washington St.
Cropper Apts., 1926, 1512 Harrison St.
Eby Apts., 1926, 1621 Van Buren St.
at right, Photo by Sellard. Gallager Apts., 1401 Madison St.
Garfield-Tubbs Apts., 1926, 1639 Madison St.
Glenmore and Canterbury Apts., 1925, 1641 Tyler St.
Hollywood Beach Apts., 1926, 322 Monroe St.
LeRoy Apts., 1836 Dewey St.
Maryland Apts., 1926, 1857 Jackson St.
Norma & Mantua Apts., 1926, 221 and 223 S. 17th Ave.
Photo at left shows this large, upscale hotel apartment building under construction. At right, the finished product complete with urns, awnings and balconies. Photo collection Hollywood Historical Society. The only Hollywood building I know that was built to resemble a California adobe. Sadly it has since been remodeled. The name means “View of the School,” referring to Hollywood Central School. Photo by Higby. Collection Hollywood Historical Society. Nearly all of those listed above are also listed in the State’s compendium of buildings erected in Hollywood before c. 1932, and therefore considered historic. Those not listed by the State in their 1980s study had already been demolished. These site files are available in the Hollywood Historical Society’s Research Center. 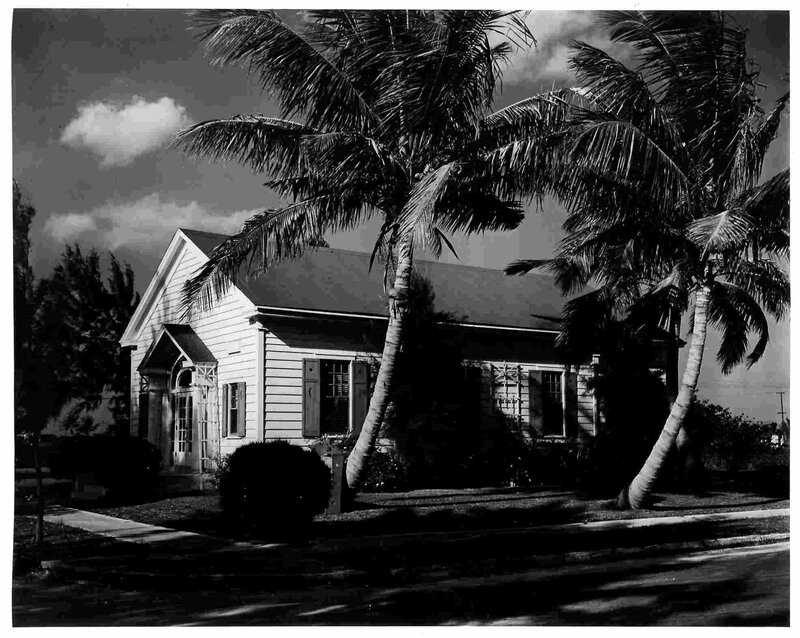 This was the first house on Hollywood beach, built in February 1924 by J. L. Frank of Buffalo NY. As the demand for housing on the beach was enormous, Frank very quickly converted the building into apartments. It was torn down within the past decade. These apartments were erected by George Young who was not related to J. W. Young or to Young’s close friend Ralph Young. The building appears to have been well-constructed, but it was left in shambles by the September 1926 hurricane, and demolished. Photo Hollywood Historical Society. This building seems quite plain for 1924-26 but as this is a later photo, perhaps it was remodeled. It’s been brought to my attention that at least one website that offers “historical” information about Hollywood, Florida, states that J. W. Young created Hollywood “as a suburb of Miami” “in hopes of building a motion picture colony.” Wrong, wrong, wrong. First off, Young didn’t put all his time, effort and funds into building a “suburb.” He was building a CITY. He founded it in 1920, and had Hollywood incorporated in 1925. Next, I can only assume that the belief that Young was trying to create a movie colony is solely based on the name Young gave to his city. In numerous previous blogs, and my books, I have explained that Young didn’t choose the name “Hollywood” due to a fascination with movies made there. He simply liked the name. There are some 18 Hollywoods in the US, some dating to the 19th century. Most were named for the holly bush. If Young had been influenced by motion pictures in his choice of name, he more likely would have chosen “Long Beach,” where he lived for about 15 years. During his time there, 1902 to 1916, Long Beach CA was indeed the major west coast motion picture setting as it was the home of SILENT movie-making including a company called Balboa Films. See the excellent book on this topic by Jean-Jacques Jura and Rodney Bardin II, Balboa Films, 1999. When Young named Hollywood, Florida, late in 1920 or January of 1921, the California place of that name was still a private housing development off in the eastern hills of Los Angeles; Young’s interest was in waterfront land. So Hollywood, Florida was not a spin-off of a Los Angeles development. NOT A MOVIE BUFF. Actually, I’ve never come across anything that suggests that Young was a movie buff. Clearly he supported live entertainment, chiefly music-related, bands, parades, concerts, dancing. From the start of Hollywood, he included musical entertainment in his hotels. J. W. Young’s “Hollywood Marimba Orchestra” playing in his Hollywood Park View Hotel, 1923. Image from Young’s Hollywood Reporter. 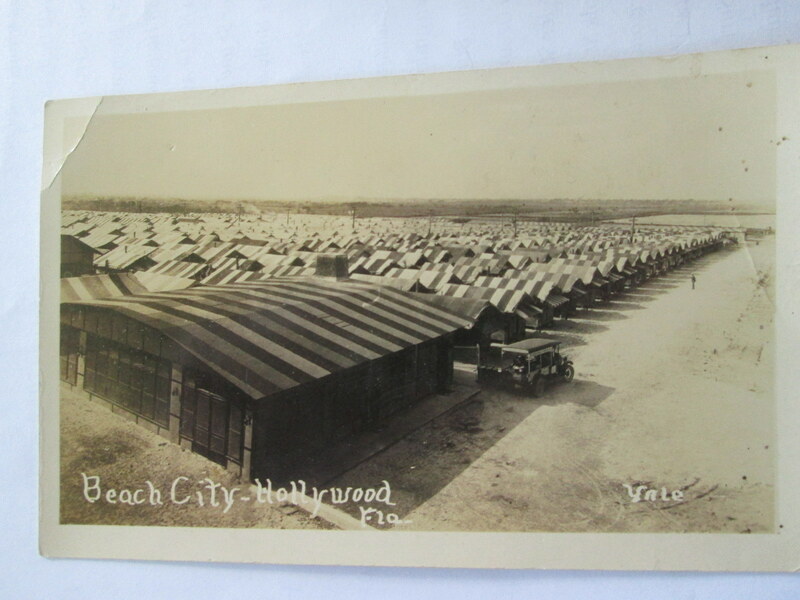 Young also provided outdoor entertainment for all his visitors, setting up bandstands in his sales pavilions and on Hollywood beach. Below is a temporary bandstand at Johnson Street and the Broadwalk, about 1925. Young went so far as to have an excellent concert and marching band on his Hollywood Land & Water Company payroll. These two photos show bandleader Caesar LaMonaca in his white suit (above) and his Hollywood band in all their finery (below). By 1926 Young was able to bring the nation’s top dance orchestra leader, Paul Whiteman, to play for the grand opening of his Hollywood Beach Hotel. NEVER BUILT A THEATER. But note: as far as movies went, Young never built so much as a single movie theater. Yes, there was a theater on Hollywood Boulevard by 1923. Photo courtesy Hollywood Historical Society. But it was strictly a stage theater. And Young didn’t build it. The builder/owner was Arthur Enos. Only in the 1930s after Young was gone, did a movie distributing chain rename that building the Ritz Theatre and set it up to show movies. J. W. YOUNG NEVER BUILT OR EVEN PLANNED SOUND STAGES. Although Young documented everything built by his company, from hotels, to office buildings, to a publishing house, to a bank, there is no record of Young and his company building even one movie set/sound stage. Young knew about sound stages as there were several in Long Beach, spread over several city blocks, while Young lived nearby. DID NOT ADVERTISE A “MOVIE COLONY.” His vast advertising campaigns don’t mention “home of” or “future home of” a movie colony. in particular the parades on the Broadwalk and marching bands on Hollywood Boulevard. Photo left: same cameraman filming baby parade on the Broadwalk, July 4, 1925. But Young didn’t own the film company. Instead he seems to have hired a firm from Miami (where there was a “movie colony”) to make this documentary movie. There’s no evidence that Young was ever interested in “story” movies such as were made in Long Beach and later in Hollywood CA. NO EVIDENCE OF A “MOVIE COLONY.” So much for Young trying to create a film colony. It’s to be hoped that the misinformed website will remove this false information about Hollywood, Florida. 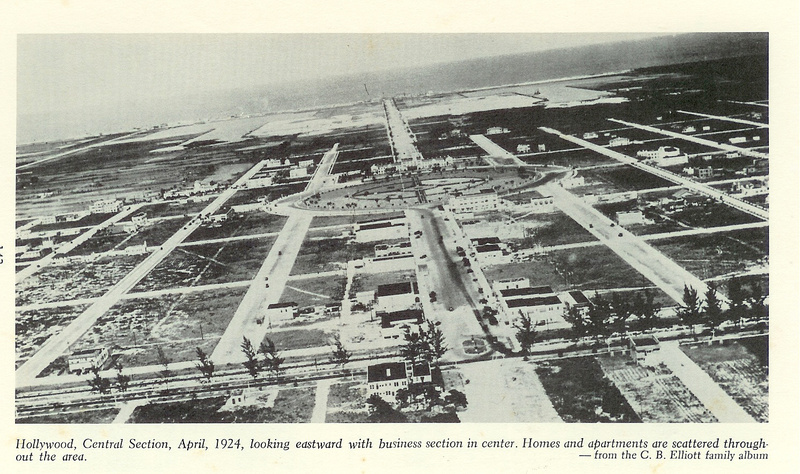 Instead, they might mention that J. W. Young’s interests were more business-oriented as he created a “City Beautiful” and an international port, now Port Everglades. Did the convicted criminal Al Capone live in Hollywood? NO, AL CAPONE DID NOT LIVE IN HOLLYWOOD. He had a large, well-guarded mansion on Palm Island in Miami Beach, which still stands and is known to have been Capone’s. He never owned property in Hollywood (you can check this out). When he bought his Palm Island place he added protective walls, and kept it fully guarded. Then he was sent first to jail in Pennsylvania, then on to Alcatraz. Eventually he returned to Palm Island, a sick old man, and died there. Read the biographies of Capone—they don’t mention Hollywood. Capone’s bases were Chicago, of course, then Miami Beach. Hollywood eventually had other mobsters, like Giancana, Jimmy Blue Eyes Alo, Potatoes Kauffman. We know where some of their houses are. But NOT AL CAPONE! Here’s a screwy legend: someone on Facebook thinks prostitution was legal in “early” Hollywood. PROSTITUTION WAS NEVER LEGAL IN HOLLYWOOD, or anywhere else in Florida that I’m aware of. Why do people want to turn Hollywood into a den of iniquity? J. W. Young created the city in 1920 as a City Beautiful, a town consciously designed to be a fine place to live and raise a family. There wasn’t any crime in Hollywood in the 20s (well, besides bootlegging) and even into the 50s people weren’t locking their doors, or cars. Open gambling sprang up in the mid-30s when Prohibition ended (cutting off that illegal source of income), but the city’s tiny population (under 4,000) didn’t like that, tried to crack down on the gambling sites, and kept legal betting at the race tracks out of Hollywood. The Hollywood Kennel Club was and always has been in Hallandale. Likewise Gulfstream Park. In 1950 the Kefauver Commission came to South Florida and shut down all the gambling (which just moved elsewhere), but this is beyond my area of research. Easy to look up yourself if you want to know more about it. But back to the suggestion there was prostitution in downtown Hollywood in olden times. (Hollywood came into existence in 1920, so “olden times” would be the 20s and 30s, I guess.) This I think is just gossip, people making up stories for their entertainment value. One example is the claim that there was a sort of brothel upstairs in the former publishing company building of the Hollywood Land & Water Company, which still stands on 21st Avenue. The first floor of the original building is chiefly two or three large spaces, while the second floor front contains a row of small rooms, with doors, and windows overlooking 21st Avenue. Because these rooms seem small today, the myth has arisen that they contained beds and served prostitutes. Oh, come on. They were offices. Window offices, overlooking the street. Downstairs was a printing plant filed with great big, very noisy presses, so the editors and sales managers and bookkeepers had their offices upstairs. At right, printers and presses on the ground floor of the Hollywood Publishing Company in 1925. Why were the offices upstairs so small? Actually, most of the houses and rooms in Hollywood buildings were smaller in the 1920s and 1930s than those we are used to now that were built after World War II. Another putative brothel about which I’ve heard gossip, is right on Hollywood Boulevard. On an upstairs floor it has a row of small rooms with a single bath at one end of a hall. I’ve never seen this one, but suspect that if it was built in the 20s, the rooms were used by men who came to work in Hollywood as the city was being built. A bath down the hall for roomers, or boarders, was extremely common, much more so than private baths, and early Hollywood was really short on inexpensive places for workmen to stay. Young even built temporary dorms around the new city where men were working, then tore these down when the land was sold to new buyers. So a private individual providing tiny rooms for workers isn’t surprising. However, if you can document the presence of an actual brothel in downtown Hollywood, I would be very interested in your documentation. FACTUAL DOCUMENTS AVAILABLE AT THE HOLLYWOOD HISTORICAL SOCIETY. So, before jumping to conclusions and jumping onto the Internet with them, a little research is in order. A large amount of information about Joseph Young and Hollywood, Florida in general can be found in the Research Center of the Hollywood Historical Society. At 1520 Polk Street, is the historic 1935 Vera and Clarence Hammerstein house. The Hollywood Historical Society’s Research Center is behind the house, which you reach by following a sidewalk along the west side of the house. It’s open every Friday morning year round, 10 to 11:30, and by appointment. At left, Hollywood Historical Society’s RESEARCH CENTER. The volunteer archivists there will be happy to help you. Just call 954-923-5590 or email HollywoodFLhistory@att.net. BOOK SIGNING DECEMBER 3, 2017. I’m delighted to announce that the Friends of the Broward West Regional Library in Plantation have offered me a booth during their Holiday Shopping Bazaar this coming Sunday. I will be there selling/signing copies of my biography Joseph W. Young, Jr. and the City Beautiful. A Biography of the Founder of Hollywood, Florida, so if you don’t have a copy yet, please stop by between noon and 5:00 pm Sunday. As Michal Sherring, I’ll also be selling/signing copies of my murder mystery Done For at the Danford. An Art Museum Mystery. This novel is set in fictitious Edgell, Massachusetts, where deaths seem to happen in the (also fictitious) old museum there called the Danford Cabinet of Curiosities and Art. The story: As people connected to the collection of still life paintings she is preparing to exhibit start to die, newly-hired Curator Robin Grinling fears for her own safety. A stranger in Edgell, she has no close allies until a moody Boston art dealer and a local Marxist art critic begin to offer clues. Using her training in connoisseurship and iconography Robin sets about to identify the murderer quickly before others are done for at the Danford. As I spent 30+ years as a museum curator and director, I write about museums from the inside, and suggest that given our training, museum curators make great sleuths! So, please come meet biographer and mystery writer Joan Mickelson aka Michal Sherring, at the West Regional Library on Broward Boulevard at 84th, in Plantation, Sunday December 3, 2017 between noon and 5 p.m. I look forward to meeting you. My next event: as part of the Lecture Series put on by the Hollywood Historical Society, I will be speaking on April 15, 2018 at the Stirling Road Branch Library, 3151 Stirling Road, Hollywood 33312. My topic is: Bare Dunes, Broadwalk, Beach Hotel, Tent City, Monster Hurricane. J. W. Young’s Hollywood beach, rebuilt in the 30s and 40s. RADIO INTERVIEW ABOUT MY J. W. YOUNG BIOGRAPHY ON STATION WLRN. On August 1st, 2017 I had the pleasure of being interviewed on radio station WLRN Topical Currents by Bonnie Berman and Joseph Cooper. We discussed my biography of Hollywood’s founder, Joseph W. Young, Jr. They are wonderful interviewers, asked helpful leading questions, making the whole experience quite enjoyable. If you would like to listen in, here is the link: http://wlrn.org/post/city-hollywood-founder-joseph-young. bookstore. The Hollywood Historical Society also sells my books. Call 954-923-5590 or email HollywoodFLhistory@att.net. McFarland, my book has footnotes, bibliography, and an Index, as well as about 90 images. J. W. Young’s plan for his city, Hollywood By-the-Sea, 1930s version expanded from the 1921 original. That’s right, it’s Young’s overall plan for his city that follows Chicago architect Daniel Burnham’s recommendations for creating a City Beautiful. Hollywood is not a simple grid around a central circle, nor is it just a city with a beach, those those are all part of it. Young’s plan is rectangular, with its central spine, 100-foot wide Hollywood Boulevard running east and west. On either end of his boulevard Young established a terminating vista, one handsome hotel on the ocean and the other hotel (now gone) on what was then the edge of the Everglades. To create elements of interest along this spine Young inserted three ornamental circles, one a park, the next the site for the city hall, and the western termination. Please note, these were not intended as traffic circles, a means for slowing north-south traffic (and yes, the city was planned for automobiles not horses). The ONLY north-south road through Hollywood when the city was planned, was the Dixie Highway, just to the west of Flagler’s railroad tracks. The Federal Highway (U.S. 1) was not put through until the 1930s. If Young had wanted to use a circle to slow traffic in the 1920s, he would have put one on the Dixie Highway. From 1923-25 Young had his engineers create two lakes, North and South Lakes, from what was originally the East Marsh. These added to the geometrical symmetry of his entire plan, with the circular lake heads repeating the circle theme, while framing the vista of the Beach Hotel on the Atlantic. At the west end the circle is banded by four arcing roads that lead the driver back to the center of town. 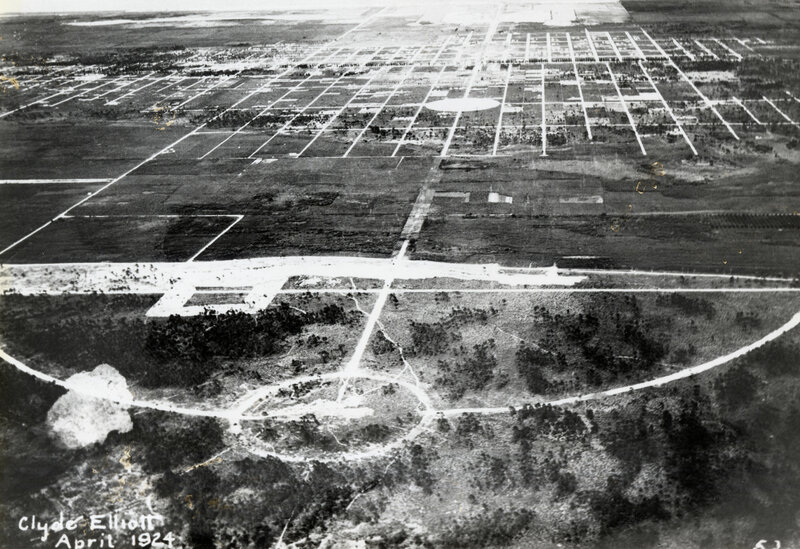 Young’s handsome, geometrical plan, which still may be seen from the air, has been praised by city planners. This plan encompassed all the area then owned by Young’s companies, ending at the west at about 56th Avenue. But reading from Young’s newsletters it seems clear that he envisioned extended his properties west farther est, but his plans were halted by the economic Depression and then by his too-early death in 1934 at the age of 51. Hollywood Boulevard looking west from Beach Hotel to Young Circle, City Hall Circle, with Riverside circle at top center. Postcard. View east down Hollywood Boulevard through the Lakes Section terminating at the grand, expansive Beach Hotel. postcard, perhaps 1950s. Today there are North-South roads in Hollywood that Young never anticipated, and the city extends almost twice as far to the west as his original plan. Nevertheless, Young’s 100-foot wide Boulevard with its three ornamental circles remain the center of Hollywood, Florida. Sorry to have abandoned you for so long. I’ve been traveling, and working on up to three books, leaving little time for research and writing this blog. One of the topics I’ve been researching is about the WAVES in Hollywood in World War II. This was the Woman’s Navy Reserve, which existed from 1942 to 1946. During that time, not only did young women FROM Hollywood join the WAVES, there were also WAVES stationed in Hollywood, together with the much greater number of Navy men that many of us remembered. Picture Navy women stationed in the Hollywood Beach Hotel in training as air navigation instructors (together with male ensigns), taking old school buses to Opa Locka air field for their flight training. 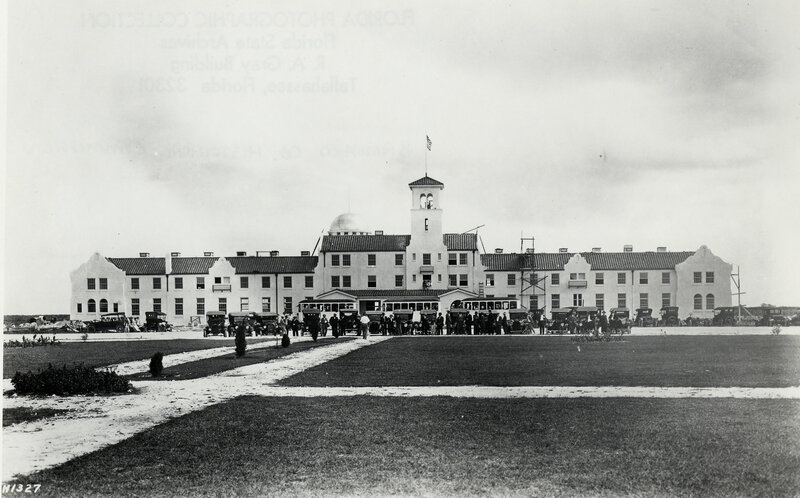 Picture Navy women stationed out west at the Riverside Military Academy campus (the third circle), already trained to use weapons from handguns to machine guns, in turn training the young sailors who would be Naval air gunners. If you live near Hollywood, come hear me speak about these Navy women on Saturday, December 3, 2016. In this PowerPoint talk I’ll tell what I have learned so far about Hollywood’s connection to the Women Accepted for Volunteer Emergency Service in the U.S. Navy. It surprised even the admirals that women fit into the Navy so quickly. Quoting from the news of Aug. 6 1943, what was originally planned to be mostly an office force expanded into gunnery and blind flying instruction, aerology, aviation ground crew work, and navigation, as well as communications. My talk is the 4th in the Hollywood Historical Society’s 2016 Lecture Series, held at the meeting room of the Broward County Library, 2600 Hollywood Boulevard, City Hall Circle, beginning at 1:00 p.m. All the talks are free, and refreshments are served.